Show your pride in your zodiac sign with a Virgo-inspired tattoo. Zodiac tattoos encompass a wide range of styles and designs, and the Virgo symbol is no different. From a simple glyph to a more dramatic scene, there are countless ways you can show off your sign with some body ink..
Virgo-inspired tattoos are as varied as the personality traits this star sign covers. Use any of these ideas as a jumping off point for your own personal tattoo. 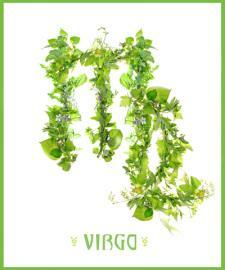 Virgo is commonly known as the virgin. 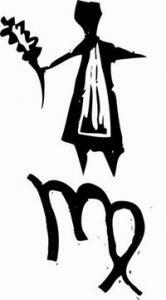 Since virgin symbolism figures so strongly in this zodiac sign, it's definitely a great idea to use in a tattoo design. Virgins are mainly portrayed as young women, and classic Virgo symbolism depicts the virgin dressed in Roman robes. You can design a tattoo around this basic concept, or you can put your own spin on it. How about a virgin bathing in placid waters? Perhaps your virgin has coaxed the mythical unicorn to lay it's head in her lap. There are a number of variations you can come up with for this theme. If you're concerned about having a virgin inked on your body even though you're no longer a virgin yourself, don't be. Perhaps you're a virgin in some other way. For example, maybe you've never been in love. Maybe you've never done something else you dream of doing, but haven't had the courage or opportunity to do it. The virgin can be a symbol of your secret dreams, and no one needs to know what she stands for except you. The glyph symbol for Virgo is a great one. I looks a bit like a cursive "M", but the last arm curls around itself and back down like a tail. The glyph can be used to ink some impressive Virgo tattoos by itself, but it looks especially good as part of a tribal style tattoo. Think about placing a tat like this as an upper arm band or back tattoo. You might decide to use a cluster of these flowers and foliage plants to represent your zodiac sign. You might also choose to have your virgin hold a bunch in her arms or lay in a field of blooms as part of a half sleeve tattoo design. Vines of ivy look fantastic trailing around a wrist or ankle. Just let your imagination wander and see what you come up with. 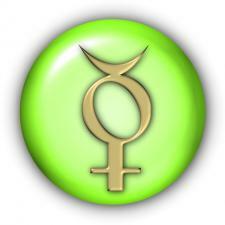 Mercury is Virgo's ruling planet, and it influences the way Virgos express themselves. As far as tattoos go, you might choose to have an actual depiction of the planet inked, but since Mercury isn't as distinctive as planets like Saturn or Mars, it might be better to use Mercury's glyph. This looks a bit like a stick figure. Picture a circle with two horns connected to a plus sign as a body. It's kind of sassy and cute at the same time. Of course, a good tattoo artist can make this glyph appear more masculine if that's the look you prefer. Blue is the color most often associated with Virgo, although brown and green are close contenders. You might want to keep these colors in mind when choosing the ink for your tattoo design. If you choose to use the virgin design, consider inking her robes in blue or giving her flowing brown hair. Green is naturally incorporated into any zodiac flower design. Since Virgo falls in the sixth house, the sign is associated with service and health. A tattoo of a strong human body may be a great homage to this sign. A representation of the virgin helping others up from the ground might also make a nice tattoo. The sign of Virgo ends at the time of the equinox. If you're looking for a symbolic tattoo, a representation of the equinox with images of the sun and the planet Earth itself might be a great way to show Virgo's earthly roots, grounded nature and rational character. This idea can work especially well if you are on one of the astrological cusps of Virgo. Constellations can make great abstract tattoos for the right person. If you're interested, the Virgo constellation has an intriguing shape, similar to an upside down bug, that can make a simple piece. The constellation's brightest star, Spica, follows the Big Dipper. As a result, the tattoo can be expanded to include other constellations. If you're looking for something smaller, inking Spica can be a great way to give credit to Virgo without tattooing a large part of your body. A representation of the star itself would look great on your ankle or wrist. No matter what your reasons are for wanting a Virgo tattoo, show it off with pride. Use your natural Virgo eye for details to help you choose a design that is as unique as you are.